THE natural beauty of Inishowen will be the focus of a talk and drone picture show later this week by local wildlife expert, Dermot McLaughlin. The Buncrana man and Wild Inishowen chairman will deliver a presentation entitled 'The Nature of Where we Live' in Buncrana on Thursday. Dermot, who is chairman of Wild Inishowen and a former town councillor, will give an overview of the myriad, wonderful wildlife stretching from Grianan Aileach to Fort Dunree. He will concentrate on three main areas in his presentation to illustrate the "great contrast and tremendous variety" of habitat and wildlife in this stretch along Lough Swilly. Buncrana wildlife expert Dermot McLaughlin to deliver talk on the stunning natural beauty of his native peninsula. These areas include Inch Levels and Lake, the woodlands north of Buncrana and Fort Dunree. "With new images taken by drone from Wild Inishowen’s great friend and supporter, Adam Rory Porter, Dermot will give his most up-to-date report yet with a real bird’s eye view of the incredible nature where we live," said a Wild Inishowen spokesperson. 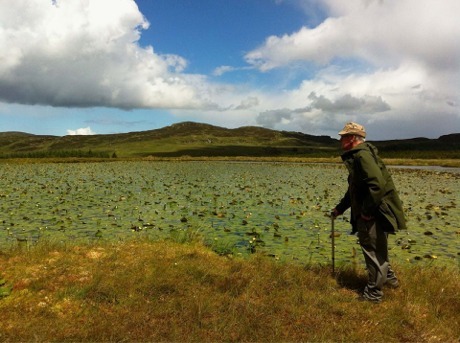 "As he has all his life, Dermot is still exploring Inishowen every day, observing nature. Having walked the walk, he is now ready to talk the talk! It is truly an evening not to be missed." The presentation will take place at The Exchange, Castle Avenue, on Thursday, April 28, 2016 at 7.30pm. It is the latest in a series by Wild Inishowen and is sponsored by Buncrana Tidy Towns. Admission is €2 with all proceeds going to promote the beauty of the peninsula. If you would like to join the Wild Inishowen mailing list for news of walks, talks and workshops, please email wildinishowen@gmail.com .